Today is the final day of the countdown teasers for the new release from Clearly Besotted. All stamps and dies will be available for purchase at 8pm BST at Clearly Besotted and Simon Says Stamp tomorrow (1st September). For my final card, I am using one of the larger sets called Wishful Thinking. I think there are so many possibilities for this lovely set, but today I went with something I don’t often do, repeat stamping to create a background. 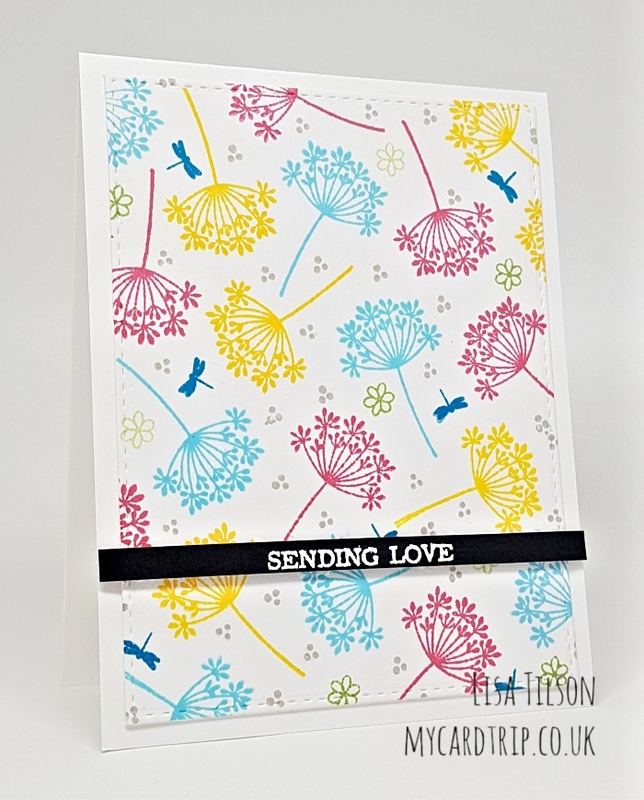 I did a few practice panels before I created my final panel because I wanted to test colours and positioning of the main stamp – as this is not a style of card that I do that often. 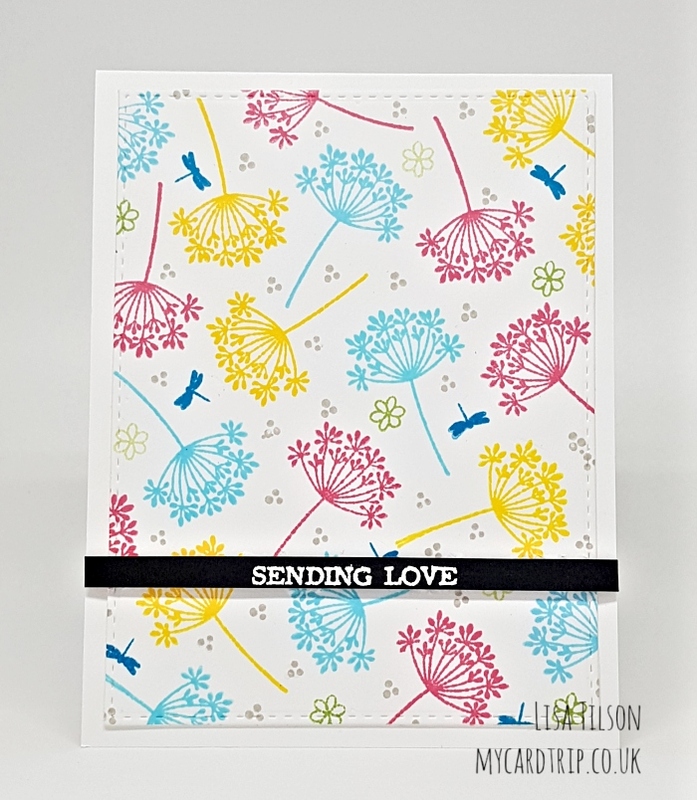 And I used my MISTI so that I could double stamp each of the dandelions and get good coverage. In the end I used three colours of Altenew Ink (Coral Berry, Warm Sunshine and Ocean Waves) for the main dandelion image and I started by working from the bottom right corner across the panel, trying to ensure an even balance of colour and correct spacing in between. You have to think ahead a little bit to do this. I also made sure I stamped right over the edges of the panel – so the pattern appears more continuous (as if you have trimmed it from a larger panel). I took the small flower from Fairy Tale Maiden, the dragonfly from Let’s Flamingo and the teeny tiny dots from Summer Treats. These little stamps are perfect to fill in gaps! So I went ahead and stamped the small flower in Frayed Leaf and Forest Glades, the dragonfly in Dusk and finally I filled in all the gaps with the dots – these were stamped in Evening Gray. I used a small acrylic block for this stamping as it is much quicker! I cut the panel down with a SSS Stitched Rectangle and mounted it onto a top folding A2 base card (Neenah 110lb) with DST. I finished by taking two of the smaller sentiments from Brushed Sentiments Plus (this is a set from the new release), stamping them with Versamark Ink onto some black cardstock. I applied white embossing powder and heat set. This was then popped up onto the panel with foam tape. I really like how this turned out and I will definitely be doing more of these in the future. I rarely just stamp a card and I forget how fun it can be – and it’s great to use inks that don’t get as much love as they deserve! I am looking forward to seeing what my talented friends have created today. 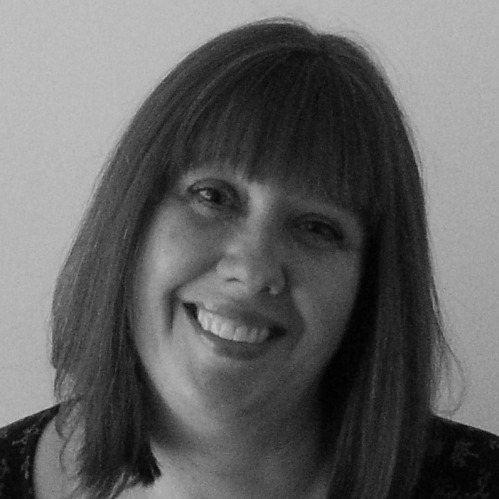 If you have time to hop over to visit Stephanie, Keren and Michelle , I am sure they will be delighted to have you visit. I will be back tomorrow with a quick post just after 8pm which will contain links to the new release for your convenience. Thank you so much for your visit, I appreciate you all so much. Happy crafting! SO pretty! I love the Wishful Thinking set! That’s a lovely pattern and card ! Thanks for sharing. Beautiful card. Love the stamp and colours. Oh so ptetty, gorgeous card images in those colours, how many colours did you end up trying in total & why did we not get to see those ? Thank you for four fabulous inspirational days. This is such a fantastic card Lisa, and proof of what you can do with just stamps. It turned out fabulous and something I never do either, but you’ve inspired me to have a go. Bought the summer treats stamp and hadn’t even noticed the three dots stamp, but what a great one to fill in small spaces.